When opening or closing the roller sunblind, parts of the body could be trapped between the roller sunblind and the frame or sliding sunroof. There is a risk of injury. When opening or closing make sure that no parts of the body are in the sweep of the roller sunblind. If somebody becomes trapped: • release the switch immediately, or • during automatic operation, push the switch briefly in any direction The opening or closing procedure will be stopped. The roller sunblinds shield the vehicle interior from sunlight. The two roller sunblinds can only be opened and closed together when the panorama roof with power tilt/sliding panel is closed. 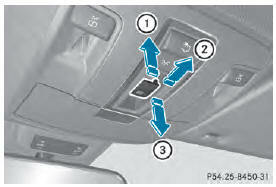 ■ Turn the SmartKey to position 1 or 2 in the ignition lock. the point of resistance, an automatic opening/ closing process is started in the corresponding direction. You can stop automatic operation by operating the switch again. If the panorama roof with power tilt/ sliding panel and the roller sunblind cannot be fully opened or closed after resetting, contact a qualified specialist workshop. Reset the panorama roof with power tilt/ sliding panel and the roller sunblinds if the panorama roof with power tilt/sliding panel or the roller sunblinds do not move smoothly. point of resistance in the direction of arrow 3 until the panorama roof with power tilt/ sliding panel is fully closed. point of resistance in the direction of arrow 3 until the roller sunblinds are fully closed. ■ Make sure that the panorama roof with power tilt/sliding panel and the roller sunblinds can be fully opened again. ■ If this is not the case, repeat the steps above again.